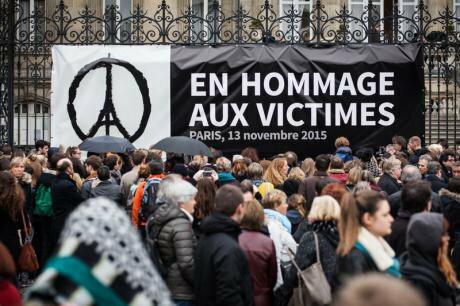 Minute of silence in Lille, 16 November. Demotix/ David Pauwels. All rights reserved. Yes, we are at war. Or rather, henceforth, we are all in war. We deal blows, and we take blows in turn. We are in mourning, suffering the consequences of these terrible events, in the sad knowledge that others will occur. Each person killed is irreplaceable. In part an outcome of the US offensive in the Middle East (both before and after 9/11), the war has intensified following the offensives in which Russia and France are now playing a major role, each with their own objectives. The war is also rooted in the ferocious rivalry between those states who all aspire to regional hegemony: Iran, Saudi Arabia, Turkey, even Egypt, and in some ways Israel – the only nuclear power of the group at the moment. In a violent collective abreaction, it speeds up all the unsettled affairs of colonisation and empire: oppressed minorities, the creation of arbitrary borders, expropriated mineral resources, disputed areas of influence, gigantic arms contracts. As we just saw, the war seeks, and occasionally finds, support among populations of the ‘other side’. Worse still, perhaps, is that it reactivates ancient 'theological hatreds' : the schisms within Islam, the clash between monotheisms and their secular substitutes. Let us be clear, no religious war is ever caused by the religion itself: there are always undercurrents of oppression, conflicts of power, economic strategies, excessive wealth, and excessive poverty. But when the 'code' of religion (or of 'counter-religion') is involved, the cruelty that follows can exceed all limits, since the enemy has become anathema. Monstrous barbarism has raised its head, reinforcing itself through the insanity of its own violence – like ISIS with its decapitations, rapes of enslaved women, and destruction of humanity's cultural treasures. But other, apparently more 'rational' brutalities are breeding too, like Nobel peace prize recipient Obama's 'drone wars', the results of which are now demonstrated to be 9 civilian deaths for each terrorist death. In this nomadic, undefined, polymorphous, and unsymmetrical war, the populations on 'both shores' of the Mediterranean are taken as hostages. The victims of the Paris attacks, following Madrid, London, Moscow, Tunisia, Ankara, Beirut, with their loved ones and their neighbours, are all hostages. The refugees seeking asylum or meeting with death in their thousands within sight of Europe's coastline, are hostages. The Kurds strafed by the Turkish army are hostages. All the citizens of the Arabic countries are hostages, caught between the iron pincers of state terror, fanatical jihadism, and foreign bombings. So what can we do? At all costs, firstly, we must reflect together and must resist all fear, amalgams, and impulses for vengeance. Clearly, we must take all necessary measures for civil and military protection, for intelligence and for security, in order to prevent terrorist actions or to counteract them, and if possible to judge and punish the perpetrators and accomplices involved. But, in doing so, we must demand the most complete vigilance on the part of 'democratic' states with regard to acts of hatred towards those nationals and residents who, as a result of their origins, beliefs, or ways of life, are singled out as 'the interior enemy' by self-proclaimed patriots. And further: require that the same states – when reinforcing their security devices – respect individual and collective rights which are the foundation of their own legitimacy. The examples of the 'Patriot Act' and of Guantanamo show us that this is not so easy. But above all, peace must be reinstated on the agenda, as difficult as it may seem to achieve. I am talking about peace, not 'victory': a durable, equitable peace, not of cowardliness and of compromise, not of counter-terror, but of courage and intransigence. Peace for all those who are interested in it, on both sides of this shared sea which gave rise to our civilisation, but also to our national, religious, colonial, neocolonial, and postcolonial conflicts. I do not kid myself regarding the feasibility of this objective. But I cannot see how the political initiatives that can resist catastrophe might be visualized or articulated more clearly, aside from the moral impulse to which this might give rise. I will give three examples. At one end of the chain, the restoration of the effectiveness of international law, and as a consequence a restoration of the authority of the UN (reduced to zero by US pretentions to unilateral 'sovereignty', the confusion of humanitarian with security aims, subjection to the ‘governance’ of global capitalism, and the politics of client-states which has replaced that of blocs). We must therefore revive the ideas of collective security and of conflict prevention, which implies reworking the foundations of the organisation – possibly empowering its General Assembly and the 'regional coalitions' of states, to begin with, instead of the dictatorship of a few powers who only agree with one another on negative goals. At the other end of the chain we have citizens’ initiative to cross borders, to overcome conflicts of belief and of antithetic belongings – which implies first and foremost the capacity to express them on a public stage. Nothing should be taboo, but nothing should be imposed from a sole point of view, since by definition the truth did not pre-exist the reasoning or the conflict. Secular or christian Europeans must therefore know what Muslims think of the use of jihad to legitimise totalitarian ventures and terrorist acts, and must also know what tools they possess to resist it 'from within'. In the same way that the Muslims (and non-Muslims) of the South Mediterranean should know what position the formerly dominant 'Northern' nations hold with regard to racism, Islamophobia, neocolonialism. Above all, 'westerners' and 'easterners' together must construct the language of a new universalism by taking the risk of speaking on behalf of one another. The closure of borders, their imposition, being to the detriment of the multiculturalism of our societies across the region, already constitutes a civil war. But from this perspective, Europe has a nearly irreplaceable function, which must be fulfilled despite all the symptoms of its current breakdown, or rather in order to remedy these urgently. Each country has the ability to lead all the others into a dead end, but every country together could draw up exit strategies and construct safeguards. Coming after the 'financial crisis' and the 'refugee crisis', war will destroy Europe, unless Europe can face up to this war. It is Europe that can work towards the re-constitution of international law, that can ensure that the security of democracies does not come at the price of the rule of law, and that can seek the materials of a new form of public opinion within the diversity of the communities living on its land. Is it calling for the impossible, then, to demand that its citizens (that is to say all among us) live up to these requirements? Perhaps. But it also goes to show the responsibility that we have to make what is still possible happen, or to make it possible again.